The Philadelphia Business Plunge is an opportunity to network with Philadelphia executives and government officials and rally behind a crucial movement. Enjoy a hot lunch before plunging into a freezing cold pool. After your body is frozen from jumping in the pool, you will start your defreeze process by changing back into your warm clothes in an onsite locker room. By the time you get back to the office, an email will be waiting in your inbox with photos from your plunge! Plunging not your thing? It’s okay to be “Too Chicken”. 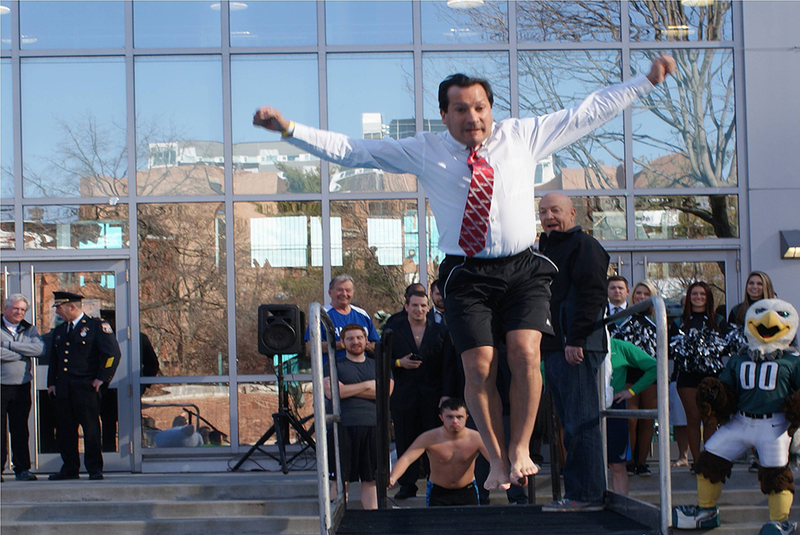 You can also join us on plunge day to watch other professionals brave the cold waters! *Please note that the locker rooms are also used by Drexel University students and staff. We encourage you to keep your belongings with you and leave them with a friend while you plunge. There are day-of lockers available on a first-come, first-serve basis that you are welcome to use. Special Olympics PA - Philadelphia and Drexel University are not responsible for any items left unattended in the locker rooms. For more information, please call Eric Cushing at 610-630-9450, ext. 229. The plunge is open to the public and all spectators are welcome free of charge.